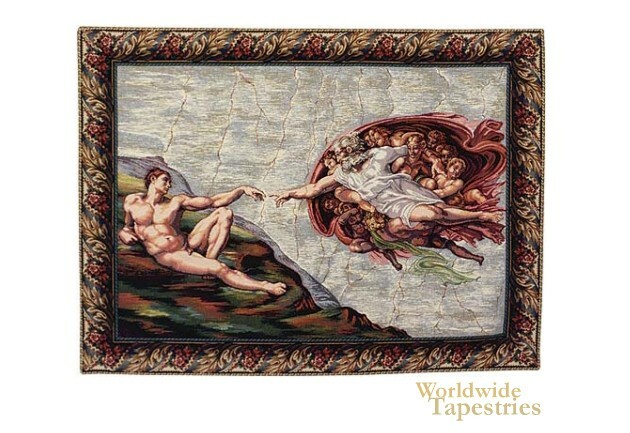 The Creation I - Michelangelo tapestry shows a rendition based on the Creation of Adam from the Sistine Chapel. Based on the work of Michaelangelo between 1508 and 1512 under the patronage of Pope Julius II, we see the iconic image where God is in a pose with Adam the first man with their fingers almost touching. This interface of man with god is said to be especially poignant and here we see the likeness of man as made in God's image in their relationship of posture. This is perhaps the most well known art work in the Sistine Chapel. This Renaissance tapestry is backed with a lining and a tunnel for easy hanging. Note: tapestry rods and tassels, where pictured, are not included in the price. Dimensions: W 29" x H 22"
Dimensions: W 36" x H 26"